There have been some really great blogs about the teacher shortage we face in Oklahoma. This Teacher Sings talks about emergency certification in other careers and how we would react. Fourth Generation Teacher talks about the educational impact and how important it is to have a teacher from the beginning of the year to the end. Okeducationtruths just gives us the numbers. Random Teacher Thoughts gives us a world view. And Excellence in Mediocrity brings it home with the importance of relationships. These are all so relevant – please read them and understand the message we are trying to communicate to our communities and policy creators. Teaching is an investment, one that takes time to earn the dividends on. Like saving for retirement. You know you should do it, but all of this other stuff gets in the way. You spend some money here, some there, you forget to save for your retirement, so you toss some money back into the account. From the day you first start working you are aware that retirement is out there, that it is important to save and prepare for it. You want so badly to enjoy it! The problem is this: without careful planning during your working career, your retirement will not be easy. You might not have saved enough money to be able to enjoy the relaxation you earned from the hard work you put into your career. You may need to work again. This is what education is like. Each investment made in a child will take over 20 years to grow and mature. The investment starts with that first wide-eyed day of kindergarten and follows them all the way through high school graduation. The investment continues as these young adults start working in college or in a trade. It continues when those adults plant seeds in the communities where they grew up. It is our responsibility as a community to ensure that these children have the best education possible. If we do not make this investment, then our long term success will be determined by luck. Luck is great – but you cannot depend on it. The teacher is the key to the returns of this investment. Without them, nothing is certain. With them, the entire universe is within reach. The teacher is so much more than the attendance taking, lunch counting, playground duty person most people seem to think. The teacher inspires. The teacher encourages. The teacher gives. The teacher comforts. The teacher gives time. The teacher celebrates the accomplishment. The teacher coaches after school. The teacher drives the bus. The teacher sponsors a club. The teacher sacrifices. The teacher worries. The teacher loves. Although teachers do not spend the majority of time with the students, the teacher often has the largest impact. Although the teacher is not responsible for the living conditions, the teacher has the most responsibility for making sure the student learns. Focus on child poverty – this should take priority. No child should be hungry or homeless. It is very difficult for children to learn when they are hungry or are worried about where they will spend the night. Treat teachers like the professionals we are. We became teachers to make a difference. Stop comparing the educational system to the free market business system. These two systems are completely different. School districts – be completely open about your finances. Let your communities know exactly what is going on. Put the pressure on elected leaders to better support your local school district. Teachers, quite whining (I do this too)! Let’s give some possible solutions to the difficult situations. I love a good gripe, but at some point we need ideas. Since we are people on the front line, lets share all of the ideas that we have. You are brilliant people – use your brilliance. Political leaders, take the challenge to be the teacher for a week in your school district. Get to the building when the teacher does, leave when the teacher does. Be sure to enjoy some grading as well. Take this opportunity to write out well developed lesson plans and create an assessment that is both valid and reliable. Create a committee of political leaders (from both parties) and educators to advance sound educational ideas and practices. Let us work together creating policy that is founded in educational research. Its okay to use ideas/systems that have been successful in other countries/states. Make sure that all school districts are equally funded – all school districts should be on a level playing field. Do not talk about education funding as a percent of overall budget. Our state budget has shrunk, if you are talking about percentages, then figure out a way to increase state revenue. It is not the educator’s fault for wanting to be well funded, just as its not the fireman’s fault to want to have the best equipment possible to save lives. You may agree or disagree with what I listed – that is the beauty. We should have healthy debate, this is where great ideas come from. 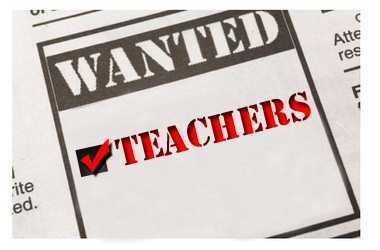 So back to the top….What is a teacher worth? What is your future worth? One Response to "#TeacherShortage – What is a Teacher Worth"
It is so critical that educators consider what they want to accomplish in their efforts with their students. Then they need to truly engage with their PLC to access and refine answers for their concerns and questions as they facilitate effective student learning. And there’s one more source of support, one that the parents and citizens can and should (must???) provide – what I refer to as Local Education Communities or LECs. I was asked to do a guest post on the topic: http://blogs.edweek.org/edweek/finding_common_ground/2013/02/local_education_communities.html. Teacher frustration and concerns do not have to lead to burnout!!! PLCs and LECs can and should make a difference!! !